While I was in Wisconsin recently, I took a short detour and drove over to check out Waterford Precision Cycles. I had a custom built Waterford done back in ’03 that I really love. I got the lugged steel RST-22. I thought I’d check out where it was born. You have to be looking for the place. It’s off the beaten path in the small town of Waterford, Wisc. Richard Schwinn – one of the co-founders – greeted me with a friendly hello and proceeded to give me a quick tour of the facility. He was joined by Gunnar the dog – the name sake of the Gunnar Bikes. Gunnar’s are made alongside the Waterford bikes. And as it turns out, Waterford also makes Volae recumbents and some Terry bikes as well as some for Rivendell. 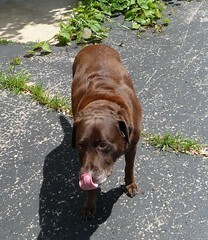 Gunnar was really a friendly dog. 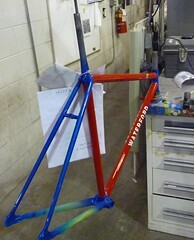 I snapped this photo of him and also a shot of one the new custom bikes in progress in the paint shop. The other was the Tommasini factory in Grosseto Italy. They were bigger but like Bike Friday had a showroom attached to check out the bikes. Kem picked up the lugged steel bug from me and decided to order a classic steel Tommasini. She was fitted by Mr. Tommasini himself. Pretty cool!